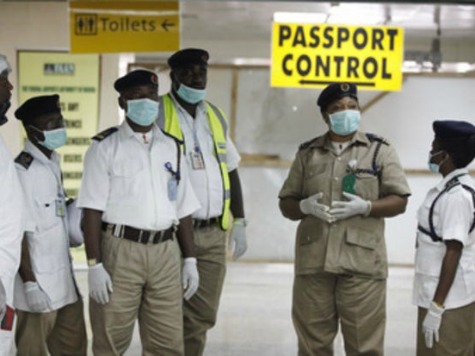 British airports are to start screening passengers arriving from West Africa in an attempt to stop the Ebola virus from entering the UK. Sky News reports that the government is expected to make an official announcement shortly, just hours after Defence Secretary Michael Fallon ruled out any such checks, saying they could create ‘hysteria’. It is likely that new arrivals will be given questionnaires asking them where they have been and whether they had contact with someone who had the virus. This afternoon, Chancellor George Osborne appeared to contradict the Defence Secretary by telling BBC News: “If the medical advice is we need to screen – it might well be – then we will absolutely take that action. Earlier today, Mr Fallon told ITV1’s Good Morning Britain programme: “There’s no need for hysteria or panic of that kind. “Every GP surgery, every hospital in the country knows how to handle this, how to check for symptoms. Certain American airports are to introduce screening for passengers arriving from West Africa, but Mr Fallon ruled out such action in Britain: “The World Health Organization advises that screening is best done when you leave a country – when you leave Sierra Leone or leave Liberia or Guinea – rather than the country you come into. “There are no direct flights at the moment from Sierra Leone to Britain so it’s not possible to be 100 per cent sure of everybody who’s coming here. Home Affairs Select Committee Chairman Keith Vaz disagreed with the Defence Secretary, however, telling ITV News: “What we need to ensure is that the public feel there is confidence at our borders and that means, we need to put in screening at our borders in order to give the public that confidence. “We also need to help these West African countries like Sierra Leone and Nigeria, to put in effective screening on passengers who leave their country.